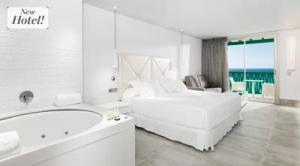 The Royal Hideaway Corales Beach by Barceló Hotel Group, awarded as Best New Hotel 2018, is located in Adeje, Tenerife and offers an exclusive and innovative luxury resort, with particular attention and thoughtful details. The hotel rooms are not only rooms for sleeping and relaxing, but are meant as an integral part of the journey. The views of the ocean and the service, which meets every wish and every need of the guests, play an important role. The property offers a wide range of adult-only dining options. These include the Maresía Gastronomic Space, which is managed by the renowned Canarian chef Juan Carlos Padrón. Visit the buffet restaurant for breakfast and dinner. The à la carte restaurant specializes in Nikkei fusion cuisine. Two other restaurants, a bar and a traditional Italian ice cream parlor are available to all guests. The spa and wellness center offers an extensive selection of massages and treatments. There is also a hydrotherapy circuit with hydromassage jets, gooseneck jets and waterfalls, steam room, sauna and showers. There's also a fitness center, as well as a barber and beauty shop. The adults-only Hotel Barceló Corralejo Bay, situated in the North of Fuerteventura, boasts few meters from the beach side. Enjoy a relaxed holiday without children with all the comfort you might look for: modern spa facilities, massage treatments, sauna and gym. 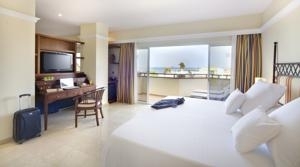 All rooms of the 4-star hotel are spacious and offer spectacular views to the Island Lobos and Lanzarote. 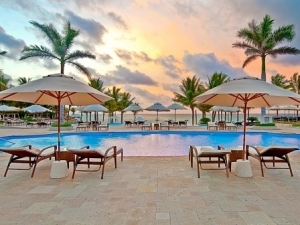 Lay back and get pampered by first class gourmet cuisine at the hotel’s buffet restaurant, which also hosts themed dinners and refresh yourself during the day at the poolside bar with live music and cocktail menu. If you look for a relaxing holiday on the Island of Fuerteventura, then book the Adults-only Barceló Corralejo Bay Hotel, guaranteeing children free vacation.